As a 31-year-old who grew up right along with Cory Matthews (Ben Savage) in ABC’s Boy Meets World, I am damned aware that the Disney spinoff/sequel Girl Meets World is definitely not for me to dig into with both claws, feasting upon the philosophical challenges of a girl growing up with a hammy moron for a father. This is a series created not even for general 12-to-whatever-year-olds, but specifically for children who understand and appreciate the Disney model of “stereotypical acts performed by attractive people exactly as the script intends them to be performed, while the biggest, fakest audience laughs along.” And you know what? I laughed, too. Granted, I was mostly laughing at how goofy and ferociously cornball it all was, but some genuine mirth escaped me from time to time, forcing me to think that maybe Girl Meets World rises above some of the other Disney mess, at least from a humor standpoint. (This is the network that has run multiple seasons of Dog With a Blog, after all.) But it seems to be trying to drill lessons into its viewers, and I don’t know that this first episode’s cautionary tale is the one that kids need to be hearing. Another tale kids don’t need to be hearing? Take a drink every time a character refers to another character’s “world,” and try to walk straight. Seriously, guys. Stop saying "world." The motif ends here. 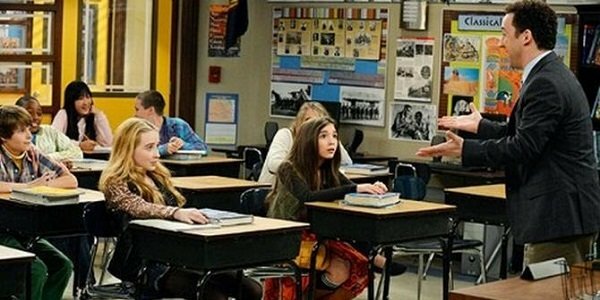 Anyway, the basic plot behind this episode, if not the entire run of Girl Meets World, is that Cory and Topanga (Danielle Fishel) have a book smart, honorable daughter named Miley Riley, whose best friend Maya is not a wonderful influence, in that she wants to sneak out to the subway by themselves. That’s behavior that’s looked down upon by Cory, but the girls do it repeatedly through the episode, and then Riley is rewarded in the end with her own subway pass, to prove that she is a smart young adult. Even though all we really see her do is aspire not to be a total loser, all while using the subway behind her dad’s back. All right, then, I guess I understand why she was commended. You know there’s a boy involved, right? That boy is Austin native Lucas (Peyton Meyer), a new student who Riley falls head over heels for, quite literally, onto his lap. He also happens to sit right behind Riley in the class taught by Cory, because Cory is now a teacher, because OF COURSE Cory is a teacher now. And he’d prefer to teach his students absolutely nothing, so long as he makes it awkward between Riley and Lucas. Admittedly, this is where Savage’s completely unrealistic acting skills work best. Another character I wouldn’t mind getting some more time is Riley’s little brother Auggie (August Maturo), who has a nice moment completely undermining Riley’s faux-existential self-conversation with questions like, “Why is cake always so delicious?” It sounds dumb, and it is, but it’s the nod-and-smile kind of dumb. Let’s be honest here. I definitely won’t be watching any more Girl Meets World episodes this season, and it’s only partly due to the insanely creepy last-second appearance by Mr. Feeny (William Daniels), which is apparently the only time he shows up this season. I had far more fun wondering why all the main characters happen to be at the same subway stop in the middle of New York City rather than what Riley is feeling about her new-found independence from bad influences. I don’t care where Riley ends up. She held up a subway train for like, three minutes. But if Farkle starts kicking it outside of liquor stores, then I’m game. And parents beware, Sabrina Carpenter also happens to sing the show’s theme song, which is reprised every time it comes back from a commercial break. Go-o-o!